Former New York mayor Rudolph Giuliani married his fiancee Judith Nathan in a ceremony at Gracie Mansion, the official mayorial residence, early on Saturday evening. The current mayor, Michael Bloomberg, presided at the 15-minute ceremony, and the best man was Mr Giuliani's 17-year-old son, Michael, from his second marriage. This is the third time Mr Giuliani - who proposed to Ms Nathan during a business trip to Paris in November - has been wed.
"I feel absolutely wonderful", said Mr Giuliani as he arrived with his daughter Caroline. "I feel wonderful". "I conducted over 200 weddings and I'm worried that I don't start doing the ceremony myself," he joked. A controversial figure as the tough mayor of New York City, Mr Giuliani gained a new reputation for his handling of the 11 September attacks and their aftermath. There were about 400 people on the guest list, including Spanish tenor Placido Domingo, who is performing an aria from one of the former mayor's favourite operas. Property tycoon Donald Trump, who like Mr Giuliani has been through high-profile divorces, was also at the ceremony, as well as media tycoon Rupert Murdoch and former US Secretary of State Henry Kissinger. Mr Giuliani, 58, proposed five months after divorcing his wife of 20 years, Donna Hanover - with a settlement that cost him more than $6.8m. He accused Ms Hanover of "cruel and inhuman treatment" while she blamed his alleged adultery for the break-up. Mr Giuliani's first marriage to his second cousin, Regina Peruggi, lasted about 14 years and was annulled by the Roman Catholic Church because the pair had not obtained the special dispensation needed for them to be allowed to wed.
Ms Nathan, a former nurse, has a teenage daughter by her marriage to wallpaper salesman Bruce Nathan, which ended in 1992. 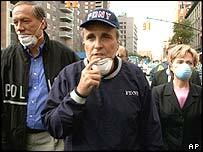 After eight years as New York mayor, Mr Giuliani's reputation had been at an all-time low before the 11 September attacks. He won worldwide praise and gained a cult status in his own country for the way he helped unite the city and handled the emergency response after the planes hit the World Trade Center.